Grew up… in Roarton, England. Kieren never really fit in with his small-town neighbors, but life was otherwise good for him. He got along well with his parents and was close to his younger sister, Jem. He'd even gotten a scholarship to an art college– but then died before even starting his first semester. Living… partially. 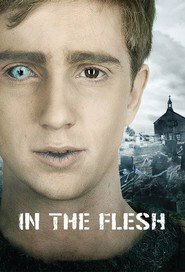 Kieren is a sufferer of Partially-Deceased Syndrome, making him what most people call a "zombie." Dying right before the beginning of the zombie apocalypse, Kieren rose from his grave and, like all other PDS sufferers, shambled around eating humans. Now they’ve discovered a medicine that restores PDS sufferers to their pre-death personalities, and Kieren is glad to be back with his family. The rest of Roarton, however, is less than welcoming. Profession… none. Kieren's was going to attend art school to become a painter, but now he’s just trying to re-adjust and avoid being murdered by one of Roarton's anti-zombie fanatics. Interests… art, long walks, and keeping to himself. Kieren might be back, but it’s a lot to process, especially when his family has to hide him in the house to prevent mob violence. With eternity on his hands, he has the time for hobbies, but right now, there are more important things to worry about. Relationship Status… single. Kieren was involved with someone before he died– but there’s no guarantee they'll be coming back soon. Challenge… adjusting to life in a hostile environment. Kieren is tortured by memories of what he did while in “an untreated state," and there are plenty of people in Roarton who think that torture should be a little more literal. Depression looms, as well as more physical dangers, and it's all Kieren can do to make it from one day to the next. Personality… quiet, kind, and creative. While some PDS sufferers are outspoken about their rights, Kieren is a more of a pacifist, preferring to keep to himself and avoiding conflict. But he can spring into sudden action if innocent people are threatened. He might not care much for himself, but Kieren refuses to see anyone suffer. Kieren Walker's popularity ranking on CharacTour is #1728 out of 5,000+ characters. See our top-ranked characters and read their profiles.